Have you started a diet? Renewed your gym membership or decided to walk more? Maybe you have resolved to cut down on Facebook time this year . . . Along with such New Year’s resolutions, some of my friends each year choose a guide word to help navigate the unknown paths of the next twelve months. Last year I began my own tradition with the word Advance. You can read about why I chose it here. This year my word is Whole-hearted! Last year, my good friend Sandra Cornelius gave me a mirror for my birthday. A survivor of many serious health challenges, Sandra took up the practice of placing mirrors in various rooms of her home during her recuperation, declaring with an inscription that she is beautiful even though she may have felt otherwise at the time. 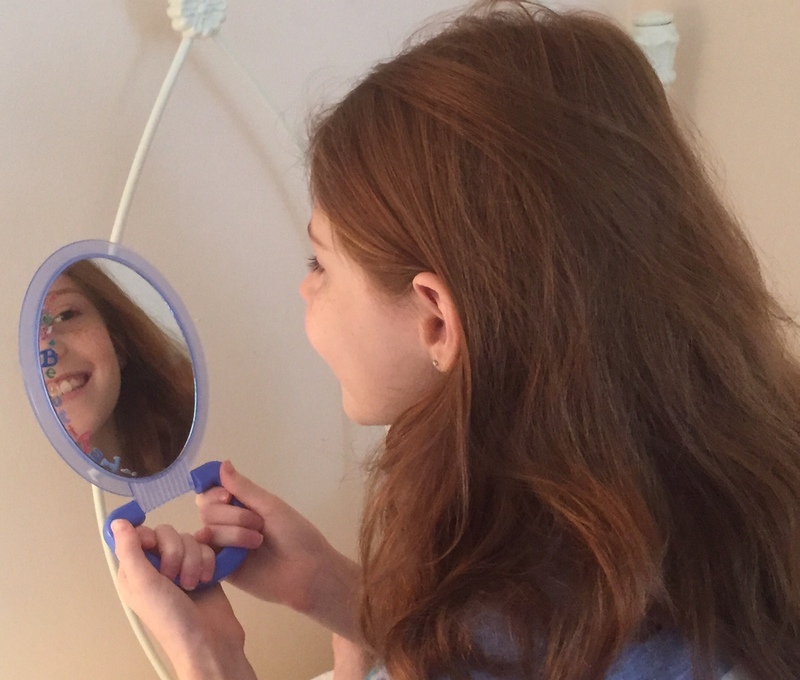 With this object, granddaughter Jenna is learning the concept of self-acceptance, which is vastly different from pride or self-importance. Just as Aibileen, the maid, praised Elizabeth’s young daughter Mae in the novel The Help, Jenna is also hearing that she is kind, smart, and important. In the month of January, named for the ancient Roman god Janus, we look two ways, with gratitude and perhaps a sense of relief for having survived 2015, and with anticipation and hope for the new year ahead. Thank you for being my companion this year. I hope 2016 will be your best ever. Have you made a resolution or chosen a special guide word for 2016? Looking back, what are you particularly thankful for this past year? Good morning, Marian! I always think of you as being wholehearted in all you do. Perfect word for you! Thank you for sharing your stories in the past year, and for being a companion of mine, as well. Thank you for cheering me on with your constant appearance here and helping me believe that publishing is in my sights. I love your word. I still haven´t come up with one. 2015 was so full of changes, my word ´accept´ was perfect.´gratitude´ comes to mind. I may have used it before but it is always a good reminder. You will have no problem being ´whole hearted´ this year. Thank you for the affirmation, Darlene. From where I stand, you are also curious, inquisitive, and adventurous for having embraced wholeheartedly your new culture in Spain. Good choice, Linda! I was intrigued with how mindfully you constructed the acrostic mingling childhood memories this week on your blog. A woman with a mind of her own – good for you, Melodie. Your words speak eloquently for you in many venues. I admire that and I join you with intent to grow and change this year as well. About your observation about Jenna posing for photos: This generation, I think, is used to having their pictures taken because smartphones make it is easy. I realize too that I am very fortunate to have her living close by. It wasn\’t always so. Until a few years ago they lived far away in Chicago. Jobs in Jacksonville brought them back to Florida. Marian — WHOLEHEARTED is a perfect hand-in-glove fit for you. I love it! My focus word this year is Alliance. 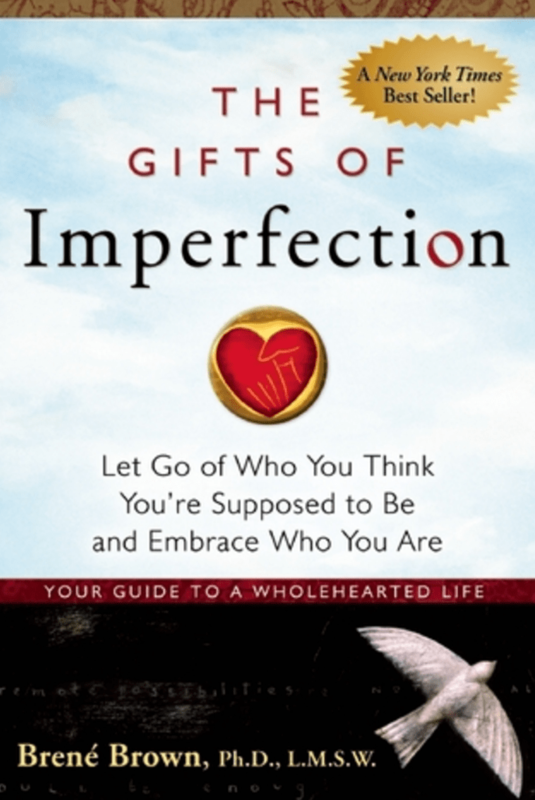 Thank you for sharing \”The Gifts of Imperfection\” by Brene Brown, I\’ve added it to my reading list. You asked, \”Looking back, what are you particularly thankful for this past year?\” I\’m incredibly grateful that our son, Evan, relocated from the midwest to Boise and is now only a mile down the road. Alliance fits you perfectly too. Count me as one of your allies as you move forward toward book publication. Wow! Whole-hearted is the best approach to just about anything. I started my diet last year, but I\’m really having to resolute for will power. I cheated over the holidays with cake and pie. Messed up my blood sugar for a few days, but quickly got back to normal. Last night I ate deep fried chicken wings and got very ill. All that horrible vegetable oil sitting on a sick stomach. It doesn\’t take much to sticking to the good stuff when you\’re used to it and try to go back. What I remember best about you in 2015 were your victories: losing weight and stopping smoking. Who cares if you have a relapse or two. You just \”pick yourself up and dust yourself off and start all over again\” or something to that effect. Apparently your body has developed a healthy aversion to junk food. Have a frabjus 2016, Susan! Oh, thank you for sharing your moment of epiphany. Sometimes we imagine other\’s lives to be all rosy and smooth but of course they aren\’t. I have been dealing with an unresolved situation for about a year and a half now. Though it\’s wearisome to wait and work and wait and work while the story is still unfolding, God is moving behind the scenes. Of that I am sure. Wholehearted! Yes, that\’s me. No resolutions. I\’m just going to live wholehearted this year. My husband is turning 80 so we\’ve got to live wholeheartedly or just sit here and age away. I refuse to do that. 🙂 Thanks for the good word! I aim to be like your husband at 80 and I\’m sure you do too. Living any other way is just half-hearted. Thank you, Marion. You are a perfect example of whole-heartedness. I feel that in everything you post. I feel it in your love for family–and now this beautiful exercise with your granddaughter. It\’s been wonderful to get to know you and feel we both have deep faith coming from different traditions–and that\’s OK with you. It\’s more than OK for me. It\’s been great to watch how unafraid you are in choosing new topics in the midst of familiar things. Whole hearted variety and spice. New Year\’s Blessings to you and yours. I see you commenting with your Sister Archetype hat firmly placed. Thank you. In this decade of our lives, there is no other way to live. Elaine, I wasn\’t actually aware that I was choosing new topics. I guess I\’m just playfully (sometimes!) following my nose. By the way, I left a follow-up comment on your Wednesday blog post. I seem to be unable to leave comments on some blogs. Short test on this one. Left you a comment early this morning. The earlier one did not come through, but as you can see, this one did. The circuits seem to be open now. My comment focused on all the elements of whole-heartedness already in evidence in this post. I can imagine you as a young girl fascinated by a hymn in which the chorus passed from the men\’s side of the church to the women\’s side. The professor in you found Jane Austen, and the grandma in your opens your heart wide open. Lucky Janna! These will all come pouring forth as you continue to write your memoir. Whole-hearted it will be! Smart phones are not so smart when they short circuit comments. Thank you for making the extra effort to re-compose and re-send. You are quite right about the various roles playing a part in this post, a correspondence I found in you reflection today too. Whole hearted is a great word to live by. I passed on resolutions this year I was and am so sick with a cold that I can\’t shake off. I still cooked during the holidays and entertained family and friends. All I need is rest and can\’t get it. I\’ve read all your post just to weak to respond. Even today running like a crazy lady lol. Yet whole heartedly serving. My son Nikki last week home promised friends at work lunch. Of course I cooked and delivered it before noon. This year I want to focus more serving my family. I was a joy to see him happy to give to his colleagues. Jenna is blessed to have you to help her develop her inner outlook of herself. I tell you I learn so much from you. I will do this this weekend with my granddaughter\’s. Have a nice week. Gloria, you already serve your family sacrificially. I hope you can get some rest so you can feel healthy again. You DO deserve it. Your life is a testimony to wholeheartedness. I see this in your comments here and from what I have observed and know about you from Mother. Happy New Year to you and all the Araujo family! A well-chosen and fitting word for you, Marian. Not just for this year, but for all you do: your writing, your focus, your emphasis, your shared memories. You give, share, remember and create with your whole heart and mind. Beautiful choice. From little on up, you and I have been taught whole-heartedness. I get the impression from your family stories there was no other way for your forebears to live life. Or for you. Thank you for the confirmation here. May you be able to create more memories with your mother this year. Time is precious, and I know you realize it. I have really enjoyed your post this week Marian…it makes such a lot of sense . Whole-hearted-ness, what a word. I think it\’s brilliant that you are teaching Jenna about her qualities…she is quite a girl, like her grandma . CHANGE is my word this year. There are many aspects of my life I want to change and now I accept I need change…so against all odds I\’m going for it . Go for it, Cherry. Laurie, who has commented above, has posted a quote on her website that has stayed with me: \”Whatever you are not changing you are choosing.\” You choose to change and I choose to accept your kind compliment – thank you. I do love that word \’whole-hearted\’! Wishing you a year full of whole hearts. Thanks for taking time out from packing/arranging to reply here. Whole-hearted wishes back to you too, Fiona. Great advice, Marian. Living a wholehearted-life also embraces my one word – \”gratitude.\” I posted a video by Brother David Steindl-Rast on Facebook about his message urging us to stop and listen. To embrace what is good in this world. Thank you for following me here as I follow your peregrinations in Arizona. What fun! Yes, we Type A\’s give ourselves a hard time in life. I mean to follow more closely Brown\’s advice to pronounce what I accomplish everyday \”enough\”! Research has shown that play sparks ideas that work, so play away, girl! This year I think I\’m going to try to be healthier in my choices, especially food. I\’m also going to try to walk two thousand miles, looking for little things to make me smile. You have ambitious goals, Marie; I admire you for walking so far and so regularly. The stats on my iPhone \”steps\” app are far behind. Thank you for inspiring me to walk more in 2016. Your blog shows your powers of observation too. Thank you too for treating me often to views of places I\’ll probably never see first hand.